There is a spring day in Barcelona when the streets are crowded with stalls selling books and roses and people buying them as gifts for their other half and loved ones. "Sant Jordi" or St George, as he is known in English, is the patron saint of Catalonia and his saint's day on 23 April is devoted to the celebration of love and literature. It is a magical day you need to experience at least once in your life. Barcelona is an international benchmark for design in a variety of fields, as can be seen from the Barcelona Design Festival, the Barcelona Design Centre, a cluster of design-sector companies and, above all, the avant-garde Barcelona Design Hub building, which houses the Design Museum. If there is one architectural style that bears the Barcelona stamp it has to be Modernisme - the Catalan Art Nouveau - whose dreamily shaped buildings have left their mark on a good many of the city's neighbourhoods. The Modernisme Route invites you to discover them! Castells are human towers and one of the most exciting forms of street entertainment to be seen. They can go up to as many as ten levels and are a marvel of balance and beauty as well as an example of teamwork. The Castellers de Barcelona put them up on the city's main festival days. Being a Mediterranean city, Barcelona has been captivated by fire since time immemorial. So one of the most popular festival events is the correfoc, literally a "fire run", where groups of devils light bangers and shower sparks over the people surrounding them. It is a very intense experience, but a safe one at that, so long as you follow some basic advice. Performing something halfway between gymnastics and art, the Falcons - an acrobatic-sports human towers group - amaze their spectators with the figures they are capable of creating as they combine their bodies. Their origins can be found in the nineteenth-century Czech Sokol movement, which combined physical exercise with national cultural values. The Falcons de Barcelona offer a 21st-century Catalan version. The Casa dels Entremesos offers a chance to discover some of the main figures - giants, "big-heads" and traditional fantastic beasts - that feature in the festivals held not just in Barcelona but in the whole of Catalonia. They are usually taken out to dance for traditional festivals such as the saint's days of Barcelona's co-patron saints: La Mercè (24 September) and Santa Eulàlia (12 February). During the Feast of Corpus Christi, a few Gothic building courtyards open up to the public to show a curious tradition that is unique in the world: l'ou com balla, getting an egg to “dances” on a jet of water - from a fountain decorated with flowers and fruit - without its falling to the ground. The tradition goes back to the 15th century and offers a lovely occasion for going round the city's historical buildings. Barcelona is the capital of Catalonia, a country whose nation boasts a long history, enjoying self-government as an autonomous region in the Spanish State. It is situated on the north-east coast of the Iberian peninsula, facing the Mediterranean Sea and bordered by Andorra and France along its north. Catalonia also has its own language, Catalan, which grew out of Latin, as did Spanish, French, Italian and Portuguese. Catalan is its official language, together with Spanish, and is used regularly in every walk of life. In addition, most of the people working in international trade and the country's main tourist areas speak English and other languages as well. Barcelona has always attracted people from all over the world, making it even more multilingual and special. It is the people living there, with their different backgrounds and cultures, who make it so cosmopolitan, diverse and intercultural. Plaça de Sant Jaume concentrates the political life of the city and the Catalan nation. In use since the Middle Ages, Barcelona City Hall and Palau de la Generalitat [Catalan regional government building] are both located in this square. The City Hall houses the Saló de Cent, literally Hall of One Hundred, which was founded in the Middle Ages by King James l, the Conqueror. Since the 14th century, most of Catalonia's 127 presidents have exercised their authority from the Palau de la Generalitat de Catalunya. 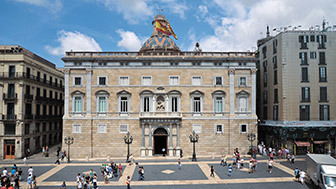 The city is also the seat of the Catalan Parliament, Catalonia's own legislative body, which has been housed in a building in Parc de la Ciutadella since 1980. One of the biggest metropolitan areas in Europe has grown up around the capital, consolidating Barcelona as an outstanding business, technological and industrial centre, as well as a major economic powerhouse. In fact, the city has always stood out for its intensive business and commercial activities and proved its ability to modernise and adapt itself to the new times. It has become such a magnet for global talent that it is now a European centre for business creation, especially in leading sectors such as information and communication technologies, biotechnology, sustainability, design and aeronautics. 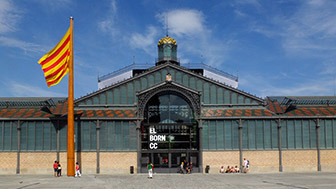 The city also plays host to several of world's most important international trade fairs, such as the Mobile World Congress and the Barcelona Meeting Point. Innovation is another Barcelona's hallmarks: it is the number-one smart city in the Spanish State and the fourth in Europe. It is also one of the cities with the highest quality of life in the world and the life expectancy of its residents is among the highest in Europe. If you want to discover the real Barcelona, you need to enjoy it during one of its big festival days, such as the festa major of the city's joint patron saint, La Mercè, which is held throughout the city around 24 September; Catalan National Day on 11 September, a festive and nationalist day when thousands of Catalans take to the streets, and St George's day on 23 April - Sant Jordi / St George is Catalonia's patron saint - when Book and Rose Day is celebrated. You will find it hard to resist our folk culture: the castellers, who put up human towers while grallas [a Catalan reed instrument] are playedand a young child, the "enxaneta", climbs to the top, raises its arm and crowns the castell; the gegants and capgrossos, giant and big-headed figures whose origins go back to medieval times that dance to the sound of traditional music; the fiery beasts and correfocs, which shower the streets with sparks as they pass by; dances such as the popular sardana, which brings everyone together in a ring on the streets and squares, and lots more. A traditional heritage that turns the city into a show. It is well known that excitement makes you hungry but there's no need to look at your watch in Barcelona. While it's true that Catalans eat later than most Europeans, there are always eating establishments open in the city, whether they are simple bars for eating a sandwich (spread with tomato, oil and salt, as is the custom) or restaurants recommended by the best food guides. People start work between 8 am and 9 am and continue up to 1.30 pm or 2 pm. They return to work from between 3 pm and 4 pm and finish between 6 pm and 7.30 pm. 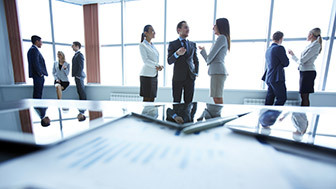 The normal working week runs from Monday to Friday and, in some sectors, Saturday as well. Most retail businesses follow the normal working week of Monday to Saturday and close around 8 pm, except the shopping centres, which do not close at midday and stay open till 10 pm. Tourist information offices open every day of the week and only close on two days of the year: 1 January and 25 December. Each office has its own opening times between 8 am and 8 pm. They have special opening times during the Christmas period. The city's public transport operates for much of the day, with times varying, depending on the rush hours. A full network of night buses covers most routes during the night. The metro runs throughout the night on Saturdays. Breakfast: between 8 and 11 am. Lunch: between 1.30 pm and 3 pm. Evening meal: between 9 pm and 11.30 pm. Despite that, restaurant opening times are flexible and you can eat at any time in lots of them. The Casa Gran, or Big House, as it is known, includes the Saló de Cent (Hall of One Hundred), where the City Hall originated in the Middle Ages. The Gothic- and Renaissance-style Palau de la Generalitat has been the seat of Catalan government since the 15th century. This opera house, built on the Rambla in 1847, is a symbol of the city's artistic and cultural life. The 22@ district is the epicentre of innovation, with nearly 1,500 high-knowledge businesses. Catalonia's MPs hold their sessions at the Palau del Parlament, in Parc de la Ciutadella. The Diputació de Barcelona, to give it its Catalan name, is housed in a Modernista mansion designed by the architect Puig i Cadafalch. The impressive National Art Museum (MNAC) building, built for the International Expo in 1929, has the best collection of Romanesque mural paintings in the world. The Institute of Catalan Studies ((IEC), housed in what used to be the Casa de Convalescència, was set up in 1907 to carry out research and popularise everything to do with Catalan culture. The former Santa Creu Hospital today houses the Catalan National Library (BC), which was set up in 1907 and has a collection running to some three million volumes. Located in the Gothic-style Palau Requesens, the Royal Academy of Belles Lettres is an institution whose history dates back to the 18th century. Founded in 1860 and housed in a magnificent Gothic mansion on Carrer de la Canuda, the Ateneu Barcelonès is an institution which promotes Catalan culture and literature. This impressive building of neo-classical inspiration is houses the main stage for the performing arts in Catalonia. This is one of the most important legacies of the 1992 Olympic Games. It is on Montjuïc and includes the main sports facilities of the time. A city icon and Gaudí's monumental work, the Sagrada Família is an imposing church still under construction. Plaça de les Glòries, currently undergoing a thorough overhaul, is surrounded by some of Barcelona's most avant-garde architecture.